If you have difficulty answering the following questions, learn more about this topic by reading our Future Value of a Single Amount (Explanation). interest refers to earning interest on previously earned interest. of time, such as months, quarters, years. value by using a future value of 1 table. and i will be 3%. 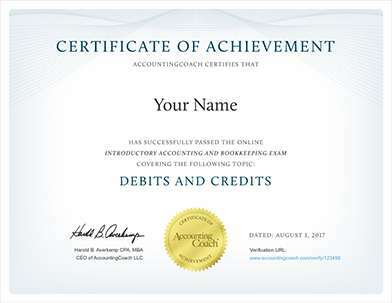 Under the Accural basis of accounting, revenues should be reported when they are earned. In this case, the interest revenue is earned in each of the three years. Which compounding of an 8% annual interest rate will result in a larger future value? This will provide more future value because interest will be earned on interest after three months (instead of one year). Interest will not be earning interest until after one year, whereas quarterly compounding will allow interest to be earned on interest after three months. on December 31, 2023 (or January 1, 2024) if it is invested at 8% per year and the interest is compounded annually. on December 31, 2023 (or January 1, 2024) if it is invested at 8% per year and the interest is compounded semiannually. on December 31, 2020 (or January 1, 2021) if it is invested at 12% per year and the interest is compounded monthly. on December 31, 2022 (or January 1, 2023) if it is invested at 8% per year and the interest is compounded quarterly. Look only in the row, n = 15, and locate the factor 5.474. It is in the column where i = 12%. Look only in the row, n = 16, and locate the factor 1.373. It is in the column where i = 2%. This means that the rate per quarter is 2%. Since the question is asking for the annual rate, multiply the rate per quarter times 4 to arrive at 8% per year. 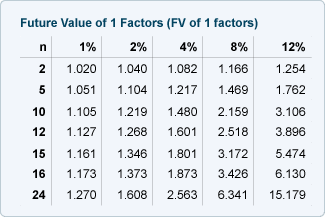 Look only in the column, i = 4%, and locate the factor 2.563. It is in the row where n = 24. This means that the number of six-month periods is 24, and that equals 12 years.